With exquisite safari camps, extraordinary wildlife and dazzling beaches, Africa is a top choice for honeymoons, romantic getaways and unforgettable celebratory holidays. A family safari is a wonderful opportunity to ‘see together, do together and be together’ far from the daily rush. Spending time with the mountain gorillas is one of the most rewarding experiences we organise. We’re riders too and have tested all of Africa’s riding safaris. We can arrange riding safari holidays to suit all levels of ability. From charming coastal villages to luxury private islands there’s an African beach hideaway within easy reach of most safari destinations. The greatest wildlife show on earth and game viewing without compare. We’ve ridden, driven, punted and drifted; we’ve floated and hiked, scrambled and flitted all over this wonderful continent in search of the best places, the best adventures and the best people to make your safari unforgettable. We love Africa, and we love what we do. Our enthusiasm is infectious, and our knowledge and attention to detail meticulous. 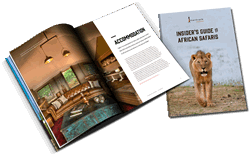 All our safaris are planned with sustainability, conservation & community high on the agenda.